Just above the cultivated Kirstenbosch Gardens, amongst the lush indigenous forestry on the Southeast slopes of Table Mountain, grows an ancient wine apple tree. During the latter half of the seventeenth century, this sturdy tree was part of Jan van Riebeeck’s farm, Boschheuvel. It is believed to be the original wine apple cultivar that was brought to the Cape by Van Riebeeck to provide fresh produce to scurvy-ridden sailors and is the oldest apple tree in South Africa. Whilst working and living in Kirstenbosch Gardens I’d often seek it out to pluck a plump apple from its branches and enjoy its unique flavour. This tree, as well as a younger relative perched alongside the dams on top of Table Mountain, was the destination of one of my most recent expeditions. 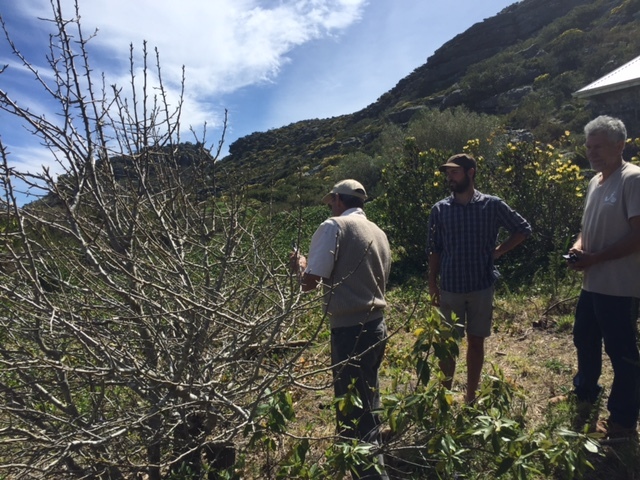 With the permission of SANParks, and in the company of my two hiking companions, our fruit specialists oom Anton Roux and horticulturist Talitha Cherry, I went about collecting budding and grafting material from these two ancient apple cultivars to bring back to Babylonstoren. 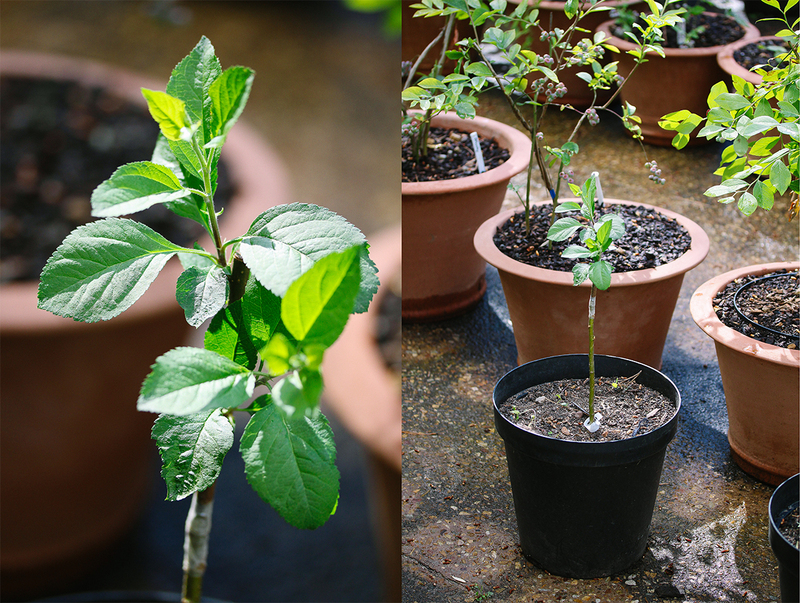 Here at the nursery, the cuttings were grafted by oom Anton onto a fuji apple rootstock and we are thrilled to see the first young leaves emerging already. We will only be able to identify the specific cultivar once it starts bearing fruit but we have a suspicion that it might be one of two ancient varieties, either the kroonappel or the wijnappel. Only time will tell. Thanks for info and picture! I so wish I could come back for a 2nd visit, the history behind some of the plants, bushes and trees in the gardens are so exciting. I hope Jan Van Riebeeks’s apple tree thrives, and I get to see it one day. I enjoy your newsletters, keep them coming. I encourage anyone going your way to pay you guys a visit. Thank you Jean, we’re happy to hear you enjoy our letters. Hope you will be able to visit again. That is such exciting and uplifting news to read in the midst of the gloom and doom of our water supply! Hi Barbara, yes it sure is! Wow……..cant wait to taste the result of your hard work. Thank you. This is fascinating, and the connection with our past exciting. I, too, look forward to knowing what transpires. Wishing you much success. Please keep us informed of tghe development of the Kroon- or Wijnappel tree. I love agriculture and I love our history. Whats more, this being done on the ex farm of my old school buddy, David Louw, gives my heart an extra beat! Hi Wynand, we are happy to hear that. 🙂 We will only know the cultivar once the tree is stronger and more mature and starts bearing fruit (around 3 to 4 years). We will definitely update the blog once we know for sure. This is such exciting news – I do hope the grafting is successful and the little tree continues to grow. Babylonstoren is one of my all time favourite places (Kirstenbosch is another) so whenever I am in Cape Town, I make a point of visiting. I am a keen gardener and have a very small orchard at the bottom of our garden in North London. Hi Maeve, thanks for sharing. 🙂 We hope so too! Thanks Kobus, we hope so too. What an interesting, unique bit of fruit grower’s history. Wishing you great success with the grafting and growth..
My wife and I will be visiting S.A. from the U.K.at the end of March and hope to eat in your restaurant. It was closed when we last visited a couple of years ago. We will look forward to seeing the apple tree cutting which has such a significant relation to your county’s founding. Very exciting! We will only know what the cultivar is once the tree is strong and mature and starts bearing fruit, which usually takes about 3 to 4 years. Once we know for sure what the cultivar is, we will update the blog. Absolute wonderful that there are people who are doing research work in this field. I for one, am an avid visitor of Babylon Storen and love the innovative, and sometimes whimsical way, in which you tend to your beautiful gardens. It is so interesting to walk along your planting alleys and learn about all the new and exciting things that you try and do to better the crops that adorn, with such amazing colours, smells and tastes, your delicious food platters at BABEL restaurant. This particular article is so interesting to me as a tour guide in Cape Town, I’ll use its details when I’m next at Kirstenbosch with my Foreign visitors. wonderful story. please keep us posted. Stunning article — thank you for sharing — looking forward to more! Well done Ernst. This is great news. I am looking forward to tasting the fruit. In England as a child I grew up with Orange Cox’s Apples & a giant cooking apple, up to 1lb in weight. My mother only used the big cooking apples for cooking she put them whole with core out, in the oven with the Sunday roast. Cox’s where only for eating. I grew up on them. Than the EU and as mother said we were forced to eat the horrible European tasteless apples, as they were grown to perfect size for marketing. The farmers were courced into planting these tasteless appeles that upset my mother no end. As apples are non indigenous, does anyone grow the Lovely English Apples in the Cape. Blanche Matilda Jessie Marshall 1911 my beauitful mother would be very pleased if they were as she ended her days on South African soil……..
how wonderful to hear this exciting news, love your enthusiasm for botany! Now that’s real news and good news too. I am coming to visit you in May 2018. Can’t wait to hear more about this project. We are so interested in your awesome news, first heard about it at Babylonstoren. Part of our history & so good to hear such positive, happy news! You are doing such a good job, Ernst & your team! This is fascinating and exciting! Can’t wait to hear which cultivar it is! Bringing history to life. Thank you Ernst for a good news story. Be it Wijn appel or Kroon appel, I am sure the flavor will be delicious with a maturity of its own. Interesting. Bringing a old antique back. It reminds me of an olive tree that was in die GARDEN OF GETHSEMINE at the time of our LORD , JESUS.A minister from the DUTCH REFORMED CHURCH in SOUTH AFRICA was allowed to take a cutting after pruning the trees. This is now a fully fletched tree in a Karoo town called ABERDENE. It would be worth a visit.